As ESA's Rosetta spacecraft flew past the main-belt asteroid (21) Lutetia, the OSIRIS camera on Rosetta surveyed the part of Lutetia that was visible during this period – about half of its entire surface, mostly coinciding with the asteroid's northern hemisphere. The asteroid's North Pole is indicated with a black dot. The unique, close-up images obtained by OSIRIS have allowed scientists to identify regions characterised by very distinct geological properties with an accuracy of a few hundred metres. By tracing craters and other features on Lutetia's surface, scientists have put together a geological map for the asteroid. Their studies have shown that Lutetia's surface comprises regions spanning a wide range of ages: each of them reveals a chapter in the long and tumultuous history of this asteroid. 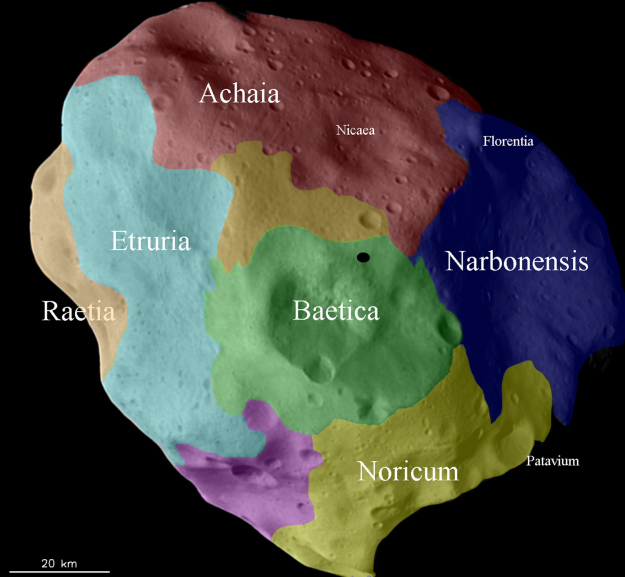 The most ancient portions on the surface of Lutetia are the heavily cratered Achaia and Noricum regions, shown in red and yellow in the upper and lower part of the image, respectively. With ages between 3.4 and 3.7 billion years or more, these two regions are almost as old as the asteroid itself. Massilia, the largest crater identified on the asteroid, is located in a younger region named Narbonensis. This region is shown in blue on the right side of the image: the depression due to the large crater is clearly visible. With a diameter of 57 km, Massilia provides evidence of the most dramatic event in the history of Lutetia. The youngest patch on the surface of Lutetia is the Baetica region, located in the vicinity of the asteroid's North Pole and shown in green at the centre of the image. This region hosts a number of superimposed craters, named the North Polar Crater Cluster (NPCC), which include three large ones with sizes exceeding 10 km. These craters represent the signature left by a series of subsequent impacts that took place quite recently on geological timescales – namely, in the last few hundred million years.